Source Drawn according Description of flag and Corporate design guidelines - National flag colours. 17:51, 3 August 2012 900 × 600 (393 bytes) Bouwe Brouwer (talk | contribs) Reverted to version as of 19:49, 12 July 2012. Please read the two documents of the government of Suriname (in Dutch language). 19:49, 12 July 2012 900 × 600 (393 bytes) Bouwe Brouwer (talk | contribs) Reverted to version as of 14:25, 8 July 2012. Please read the two documents of the government of Suriname (in dutch language). 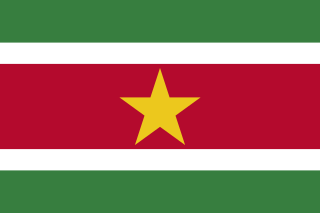 14:25, 8 July 2012 900 × 600 (393 bytes) Bouwe Brouwer (talk | contribs) Colours according the corporate design guidelines of the republic of Suriname; star redrawn according the official description of the flag. This page was last edited on 24 November 2018, at 22:36.